Community structure is one of the key properties of complex networks and plays a crucial role in their topology and function. While an impressive amount of work has been done on the issue of community detection, very little attention has been so far devoted to the investigation of communities in real networks. We present a systematic empirical analysis of the statistical properties of communities in large information, communication, technological, biological, and social networks. We find that the mesoscopic organization of networks of the same category is remarkably similar. This is reflected in several characteristics of community structure, which can be used as “fingerprints” of specific network categories. 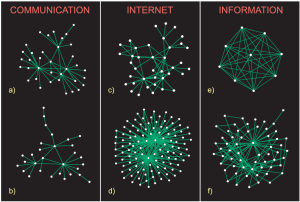 While community size distributions are always broad, certain categories of networks consist mainly of tree-like communities, while others have denser modules. Average path lengths within communities initially grow logarithmically with community size, but the growth saturates or slows down for communities larger than a characteristic size. This behaviour is related to the presence of hubs within communities, whose roles differ across categories. Also the community embeddedness of nodes, measured in terms of the fraction of links within their communities, has a characteristic distribution for each category. Our findings are verified by the use of two fundamentally different community detection methods.